Istighfar is also known as Astaghfirullah is the act of seeking forgiveness from Allah. We ask forgiveness from Almighty Allah by repeating the Arabic words Astaghfirullah, which means “I seek forgiveness from Allah.” Istighfar means to get strength from Allah to refrain from sin and evil and to be able to display this strength to refrain from sin. We should always seek forgiveness from Almighty Allah as He is The Most Merciful. We do Istighfar not necessarily after committing a sin or an act of disobedience to Almighty Allah but is also includes our shortcomings. Allah loves those who seek forgiveness and repent and make them clean from sins by seeking Allah’s forgiveness. Istighfar is also a means of building up that awareness of Allah and strengthening our relationship with Him. We turn to no one except Allah in repentance. We confess our deepest errors, shortcomings, failures, and sins to Him and we ask forgiveness from Him alone by doing Istighfar. As we know the importance of Istighfar now let’s discuss some virtues and benefits of reciting the simple and beautiful supplication that is “Astaghfirullah”. 1) Get Dignity (Grace) from Almighty Allah: Grace is the most important thing that we need to do something or for doing some activities. Without Allah’s grace, all of our doings will be not accepted by Allah Almighty and they will be useless. In Holy Quran, Allah Almighty stated: “And that “Seek forgiveness (of) your Lord and turn in repentance to Him, He will let you enjoy a good for a term appointed. And give (to) every owner (of) grace His Grace. But if you turn away then indeed, I fear for you (the) punishment (of) a Great Day.”(Quran, 11:3). From this verse we conclude that if we seek Allah’s forgiveness and do good deeds then we get His grace otherwise we will get punished on the Day of Judgment. 3) Avoid Punishment: A person who constantly and regularly does Istighfar will be forgiven by Allah Almighty. Allah will not punish the people who always do Istighfar. The Istighfar that we rejoin with a great deal of appreciation and guilty will also be able to withstand the coming of suffering and failure. Allah says in Holy Quran: “But not is (for) Allah that He punishes them while you (are) among them, and not is Allah the One Who punishes them while they seek forgiveness.”(Quran, 8:33). So we can say that Istighfar opens the door of mercy. 4) From Istighfar one can improve himself: We as a human often make mistakes, are often tempted, often neglectful of established rules. Human should be punished for the misdeeds, but Allah delayed the punishment to the Hereafter. Before the deadline that is the Day of Judgment, humans are given the opportunity to improve themselves by repenting. In the first step of self-improvement, he emphasized the need for self-approach which is called Istighfar. Astaghfirullah also helps us to refrain from all forms of sins. Regularly saying this reminds us that Allah is everywhere and in this way, there are very small chances of doing wrongful actions. So from Istighfar, we can improve ourselves by staying away from bad deeds and doing righteous deeds. 5) Increase in Wealth, Children and Pleasure: In Holy Quran, Allah Almighty says: “Ask forgiveness (from) your Lord. Indeed, He is Oft-Forgiving. He will send down (rain from) the sky upon you (in) abundance, And provide you with wealth and children, and make for you gardens and make for you rivers.”(Quran, 71:10-12). In this verse, Allah Almighty is promising us that wealth comes with Istighfar, as does children. Istighfar will open the doors that have been closed until today. Wealth and children come from Allah and it is in turning to Him that we will get them, not in turning away from Him. So it means Istighfar is the gateway to productivity. 6) A ticket to the Heaven (Paradise): Allah has promised and guaranteed a place in the heaven (paradise) for His servants who always do Istighfar. This shows the most important of Istighfar because every Muslim’s dream is to go to the heaven after the death. 7) Give strength to the prayer: Allah promises those who do Istighfar regularly to give a good life continuously throughout the life of the world until it comes to an end and gives various advantages and benefits to those who always Istighfar and begs from Him. We will get more spirit and strength by saying Istighfar every day. We need Istighfar to constantly purify and cleanse our heart. We are not born in sin, but we are born in weakness. We are prostrate to fall prey to the many fascinations that are part of our test in this life. And when we fall in these provocations and commit sins it takes us far away from our Lord. But there is a hope for those who want to seek forgiveness from Almighty Allah and the best is by doing Istighfar. 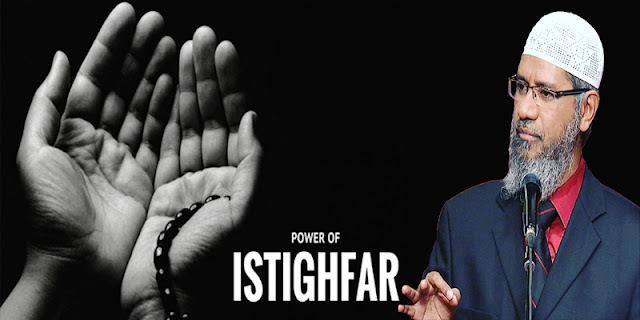 The one who does Istighfar and admits his weakness to Allah becomes nearer to Him. May Allah gives us the strength to seek forgiveness of our sins that we did and also give us the strength to do righteous deeds, Ameen!